You have to admire the resiliency of metal culture. Not only has it shown a remarkable adaptability and willingness to evolve, but its continual advancement of genres, coupled with its infinite number of subgenres, has given it a chance to survive where other styles and trends have simply fallen by the wayside. As grindcore slowly fades from the foreground of metal consciousness and drone seemingly hits its peak, metalheads everywhere have already begun wondering what comes next. Thrash-prog? Neo-Viking? Black/Death fusion? Those may all find their moment, but Scottish foursome Alestorm has another, arguably better idea: pirate metal. The casual observer’s first reaction might be to ask, “Are they serious?” One listen to the group’s new Leviathan EP answers in the affirmative in highly convincing fashion. Initially laughable and nearly begging for easy dismissal, these four tracks actually show a band employing a brand of power metal far more serious and intelligent than the gleefully ridiculous lyrics, artwork, song titles, theme and band mentality would suggest. For example, while it may be hard for even the most ardent metal scholar not to giggle when vocalist/keytarist Christopher Bowes sings how the band travels through the sky in cosmic steel battleships before ripping into a sea-shanty accordion solo on “Heavy Metal Pirates,” the scorching synth solos by Bowes and equally searing guitar pyrotechnics by Dani Evans that follow will force even the most demanding metalhead to take notice. Right out of the gate, Bowes tells a sea tale of man versus beast on the epic title track, complete with mythical creatures and adventures into the depths of hell along the ocean floor. The grim tale drips with gore and peril, matched only in bombast by the sweeping keyboard arrangements and Evan’s masterful employment of the flutter bar during the second guitar solo. Nowhere does the group plunder more mightily and pillage more thoroughly than on the group’s cover of “Wolves of the Sea.” Originally written by Latvian musical collective Pirates of the Sea as their Euro-danced flavored entry into the 2008 Eurovision contest, Bowes and company scrap the pulsing dance beats in favor of pub-style vocal harmonizing, furious double-bass work by drummer Simon Dugard and the kind of intense low-end riffing that surely would have had Latvia kicked out of the competition, if not entirely out of the European Union. Is this ridiculous? Preposterous? Even a bit silly? Probably, but in the face of music like this none of those things matter. Like the song says: raise the Jolly Roger and sail into the night. 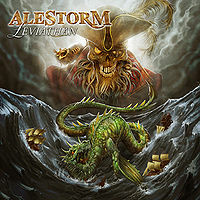 Alestorm are heavy metal pirates, and soon they’ll come for you.